A beautiful, functional website will make you stand out and be discoverable online. With Wood Graphic Design at the helm, your site will be modern, include the latest coding techniques (like CSS animations), and have great SEO to get you up the list on search engines. NOTE: We can use other website builders upon request including Wix, Weebly, Shopify, or Wordpress but certain features may vary. Why do we recommend Squarespace? It is an easy-to-use but very customizable site builder similar to WordPress and Wix but with better support. Also, it gives our clients the ability to see their site as we work, and even edit their own site when we’re finished. By the time we’re finished with your site, you’re guaranteed to love it, too. 97% of consumers look online first before buying locally. Social media alone does not help you rank on search engines and does not replace a website. 75% of judgements on a company’s credibility are based on the company’s website design. Nearly two-thirds of small businesses rely on websites to connect with customers. 97% of people search online first to find local businesses. Get your business on the search engines and finding customers with a professional site. Keep everyone current on your engagement and wedding. Post pictures, list wedding gifts and share your story leading up to the big day. Got a festival, fair, reunion or other event you need to market weekly, monthly or annually? A website is a great option! We offer online stores with flexibility and discoverability. List products, manage inventory and share your custom-designed storefront. If you're running for office, you need an office online. Spread your campaign with a beautiful site and chart-topping SEO. Spread the news or just share gossip with your own news site. Includes features like article tagging and social media sharing. There are a couple things that you are required to pay for when building a website. The design and development costs for our websites can go as low as $300. If you need a price quote for your project, please send us detailed information about your project and we’ll get back to you within 24 hours. We specialize in logos that are both flexible and will stand the test of time. Your logo is often times the first impression people will have of your business, whether it's on a sign, a business card, or on your website. It's the calling card that anchors a brand and represents who you are as a business. While your logo is the anchor of your business, your identity is the sail. An identity is the visual aspects that form part of your overall brand including fonts, colors and layouts used in advertising and print collateral. Your final identity will include a branding guide to help your brand remain consistent and focused. Get your low quality, rasterized (jpg, png, gif) logo redrawn as a vector image (eps, pdf, ai). A vector image can typically be described as a infinitely scalable, editable image. This gives you freedom when it comes to graphic design and illustration. As such, vector images are ideal for company logos and other design images that often require scaling. One of the most important parts your branding is having consistent and eye-catching print collateral for your business. 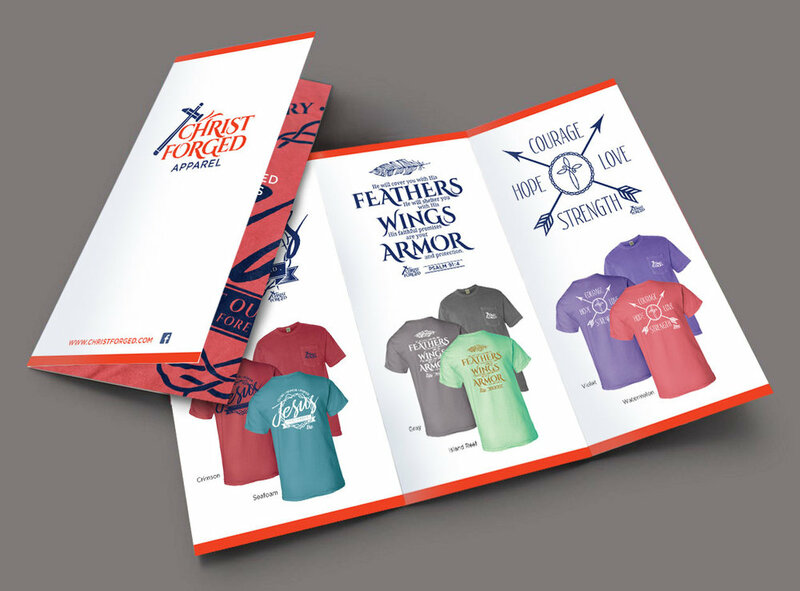 Once your project design is complete, we can work with local printing companies to get your project printed. Using an in-depth understanding of composition, Wood Graphic Design can make a creative and interesting layout that helps your publication or advertisement stand out.